Exactly one week ago, 14th of July was Gilyn's last day in the office. Instead of doing the "goodbyes" processes, we just planned a super "eating moment" on that day. The first part was a team lunch in Thai Express in Holland Village. I was delighted to know that we will be having our lunch there because I've been missing eating Thai foods. I was a bit late so I ordered immediately my favorite Thai cuisine which is "Phad Thai" and an avocado shake. I'm quite used to the "chilliness" of Thai foods and I was surprised seeing others sweating a lot and it was kinda funny. It was such a nice day to have a lunch together as a team (I think it was the first time ever). Gilyn gave us a remembrance, it was a scrap sheet and was nicely designed. 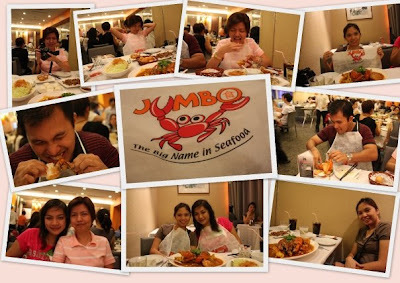 The second part of the "eating moment" was in Jumbo Seafood Restaurant in Clarke Quay. I was on night shift so I had my dinner in this place, it was my first time on such area. I was again, late but nevertheless, foods were still fresh and a smile was seen on my face when I got the sight of chilli crab! Hahaha... Ate Vinz, Ate Arlene and Gilyn was taking pictures while I was eating the rest of the foods. I loved the scallop (I forgot the exact menu name of that) and this certain squid. We were done at almost 9 in the evening so I had to get back to the office while the three ladies roamed the area and enjoyed the rest of the night. With the latest update, Gilyn found a new job and was quite confused on something!